Central African Republic (CAR) is one of the poorest countries of the world located at the centre of Africa Continent. It is a very resourceful country with vast geographical area of 6 lakh 22 thousands square km. CAR exports diamond, timber and is rich in uranium, gold and oil. The landlocked CAR is surrounded by Chad, Sudan, South Sudan, DR Congo, Congo Brazzaville and Cameroon. Bangui is the biggest and capital city of CAR. CAR got independence on 13 August 1960 from France. The State Language of CAR is French and the local language is Sango. CAR’s population is 4.6 million of which 80% is Christians, 15% Muslims and 5% others. Ms Catherine Samba Panza is the President of CAR. CAR has been plagued by political instability and experienced armed rebellions since it’s independence in 1960. To bring stability and peace in CAR many international and regional organisations worked over the years. Sensing high risk of genocide and before becoming a failed state, the UN has approved the deployment of peacekeeping force on 10 April 2014. Accordingly, United Nations Multidimensional Integrated Stabilisation Mission in CAR (MINUSCA) has been deployed. CAR remained French colony from 1903 until it’s independence. France used this land primarily to take gas and oil from Chad through Cameroon. Following the independence of CAR France retained its influence by supporting the 1st President of the country, David Dacko. In 1966, promising to fight corruptions, Chief of Army Staff General Bokasa took power by a military coup. Since then CAR has experienced many coups and counter coups and political instability. This has weakened the ability of successive governments to extend their authority throughout the country. The security situation deteriorated further since the Seleka-led coup overthrew President Bozezi and brought the Seleka leader Micheal Djotodia to power on 24 March 2013. Micheal Djotodia has to leave power on regional pressure on 10 July 2014. An indigenous militia called Anti-Balaka was formed to respond to Seleka atrocities against the local populations. This has further worsened the security situation as thousands of people have been tortured and killed while substantial properties have been burnt and looted throughout the country by Anti-Balaka militias. In January 2014 considering the turmoil of CAR Ms Catherine Samba Panza, the Mayor of the Bangui city was chosen by the African Union as the President to lead the country. The only military component of CAR is the Army. No component of Navy and Air Force exist in CAR. Presently a limited number of National Police and Gendermarie (community police) are working in administrative cities. The UN deployed 10 thousands military and 1,800 police in CAR under MINUSCA. Troops contributing countries are Bangladesh, Pakistan, Nepal, Senegal, Egypt, Sri Lanka, Indonesia, Niger, Tanzania, France, Gabon, Rwanda, Cameroon, Congo, Ghana, Mauritania, Bhutan, Check Republic, Burundi and Morocco. Lt General Babakar Gaye is the Special Representative of UN Secretary General in MINUSCA. Major General Martin Choumu Tumenta is the Force Commander. Major General S M Shafiuddin Ahmed of Bangladesh Army was appointed as the Deputy Force Commander (2015). Bangladesh Army took over the responsibility in CAR under MINUSCA on 19 September 2015 and deployed 924 army personnel in CAR including BANBAT-750, BANMED-69 and BANSIG-70. The intent of the MINUSCA is to protect civilians of the country. In accordance with the concept of operations of the UN Mission three sectors have been given responsibilities of three different areas such as Sector West – Headquarters at Bour city, Sector Centre—Headquarters at Kaga Bandoro and Sector East – Headquarters at Bria. Bangladeshi peacekeepers were deployed under Sector West keeping its Battalion Headquarters at Bour city. Sector West remains the most volatile area of CAR. The principal threat to population is armed bandits and interdiction along main supply route of CAR. The North-West border with Cameroon remains volatile resulting small scale raid, ambush, burning houses, robbery, killings, illegal toll collection etc. Numerous skirmishes occur with Anti-Balaka elements since all key terrains of this area are controlled by them as the presence of ex-Seleka is dormant. The Fulani and their cattle herds continuously become victims of the terrorist groups. Bangladesh Battalion (BANBAT) has some significant success within a short span of time in CAR. BANBAT was assigned to keep the life line of 610 km roads from Bangui to Cameroon border which was named street without joy before takeover by BANBAT. The bandits, miscreants were launching surprise attacks on the convoys and looting materials/foods causing casualties of personnel. Series of incidents took place near Lokoti village of Bour. On being deployed, with the experience of counter insurgency operations in Chittagong Hill Tracts, BANBAT could turn the street into safe route for the convoys and personnel. The street again became the street with joy. Thus the BANBAT won the heart and mind of the local people and received the appreciations from all concerned. In absence of law and impunity Fulani (Floating population of Sahara desert) became easy victims of miscreants in CAR, especially in Sector West. Since protection of civilians is the prime mandate of MINUSCA, it is an utmost important task to rescue the victims from captivity of Anti-Balaka militia group. Operation Beko-2 is such a type of rescue operation by which a 43-member Fulani group along with their cattle was rescued from Lambi village on 8 May 2015 under overall security protection by BANBAT. They were kept hostage by Anti-Balaka group. The operation Commander was Major Jasim of BANBAT while composition of operation team was as 40 members from BANBAT, 10 military observers, two from UNHCR and two civilian staff from MINUSCA. This is one of the classic examples of civil-military cooperation for the achievement of common goals of UN Mission. Bangladeshi peacekeepers earned love and appreciation of the people of CAR by discharging their duties sincerely. They conducted some activities of civil-military cooperation – CIMIC in CAR for the welfare of common poor and distressed people. Deputy Force Commander Major General SM Shafiuddin Ahmed (Bangladesh Army) on 17 December 2014 inaugurated medical campaign in Bour for providing medical treatment to the poor local people. Then level-1 hospital provided free medical treatment and medicine to the poor people. Colonel ABM Shefaul Kabir, the Contingent Commander, inaugurated medical campaign on 7 April 2015 at Bosembele and on that day level-1 hospital provided medical services and medicine to the local population from 9 am to 4 pm. On 6 March 2015 a goodwill football match was arranged for the local women at Bour Stadium. The ceremony was attended among others by Nana Mambere, the Head of Office of MINUSCA. From 17 March to 4 April 2015 Major Tariqul Islam conducted a language training course at a school in Bour. A total of 27 male and female trainees participated in the course. Of them 20 participants successfully completed the course and were awarded certificates. Brigadier General Evariste Murenzi, Sector Commander of Sector West handed over the certificates as the chief guest. A nine-member Bangladeshi Peacekeeper team led by Lt Hosain Rafiu Ahmed rescued a civilian Muslim hostage from Anti-Balaka group from a village nearby their Boali camp. An unfortunate Muslim named Abdulai Mamadu became target of Anti-Balaka group. An adviser of Anti-Balaka gave him shelter in his house intending to save his life. But 200/250 members mob surrounded the house and wanted to kill him. The Bangladeshi peacekeepers being informed rushed to the house along with local Administrator Ms. Suprike and rescued Abdulai Mamadu without any unwanted incident and sent him to Bangui for treatment. A 13-member goodwill delegation led by Major General Salahuddin Miaji visited CAR from 13 May to 16 May 2015. I was one of the members of the team. We reached Bangui in the morning on 13 May. Afternoon on 13 May we went to Forces Headquarters where our delegation leader Major General Md Salahuddin Miaji called on Special Representative of UN Secretary General Lt General Babakar Gaye (Senegalese) in CAR. He cordially exchanged views with the Bangladeshi General and said, Bangladeshi Peacekeepers are very much sincere, disciplined, and professional. Especially mentionable quality is that they can easily mingle with the general people and can make them nearer and dearer ones. General Salahuddin also called on the Forces Commander Major General Martin Choumu Tumenta. During their calls on Major General SM Shafiuddin Ahmed, Deputy Force Commander was present. On 14 May we visited Bour city where BANBAT was deployed. Bour is not a very big city. Here lives about 40 thousands people. It’s a very under-developed area. Most of the houses are mud-hut. During our visit there was a briefing on BANBAT activities. After briefing we attended lunch where Yasmini Thiam, Head of Office of MINUSCA was invited as special guest. We talked to Thiam about Bangladeshi peacekeepers’ activities. 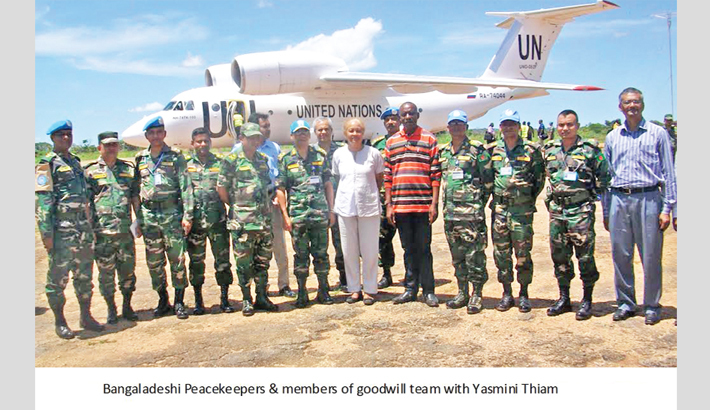 She said, I am very much impressed by Bangladeshi peacekeepers’ performance. She appreciated the hospitality and friendly behaviour of Bangladeshi Nationals. Then we posed for photo session with her at Bour Airport. It was my great pleasure to see Lt Commander Tania Sowgat and Lt Commander Mirza Rokaiya Noor of Bangladesh Navy deployed at Forces Headquarters in Bangui. Lt Commander Tania is working there as Staff Officer (Intelligence) and Lt Commander Rokaiya as Staff Officer (Personnel). Lt Commander Tania joined MINUSCA on 31 October 2014 and later Lt Commander Rokaiya came. Lt Commander Tania said, I am very happy to be here in a multinational environment. My reporting boss is Lt Colonel Steave Salot of US Army. He was very much helpful and cooperative to me. I could perform my duties smoothly with the cordial help of him. Lt Commander Rokaiya said,” I feel proud and honoured to be a part of global peace effort of UN as a Bangladeshi female officer.” But she has a small pain in her heart because she left behind her a six year old kid Nayeera Imtihal Rahman at home for one year.